This booking is Non-Refundable and cannot be amended or modified. Failure to arrive at your hotel or property will be treated as a No-Show and no refund will be given (Property policy). 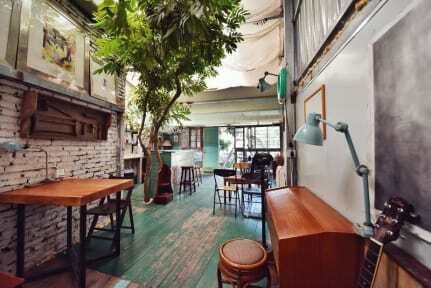 Gooood day fellow backpackers, The Backpacker Village Hostel is a little watering hole hidden amidst the bustling local university town (Xiamen University). Xiamen University happens to be one of the largest university in the southern parts of China, which also means that there is an endless amount of tasty cheap local food joints surrounding the area. We have all a backpacker needs for a comfortable stay. What’s more, we offer free WiFi, rich information about travel destinations in China and a cozy atmosphere to share the information. We locate in a village surrounded by mountains/hills, beach and sea in Xiamen. With half an acre farm land in the front of the house, we named our hostel Qian Tian Hou Cuo in Chinese (Cuo means house in local dialect). It is only 150 meters away from the bus station of Xiamen University Student Dormitory. Here, you will find a lot of restaurants offering local specialties, pubs, Café, 24hr convenient stores and more. Besides the basic amenities that you would require (Beds, Linen, a huge range of affordable imported drinks etc. ), we have an attached washroom in all rooms including our dorms, which is pretty rare in this part of the world. We are super social! While we may be limited by our English capacity, we are nowhere less in our hospitality. We love to chat, have some drinks and hangout in our yard (during winter at least :p). We can share with you our experiences travelling around China and we hope to hear yours from around the world. Every little thing here has a story! Almost all our decorations and cool little things are donated, scavenged or created by ourselves. We take pride in our quirky, whacky arrangements and ambience that we hope you find interesting. We cook really awesome food! If you are cool, and we are in the mood, we would whip up a Chinese feast! Do note that this is not a guarantee (we may be limited by time and manpower) but if it happens, lets all enjoy. Cheers! Some say our beds are a little basic (in the dorms) and we may have to agree with them, we do not have huge thick comfy beds here much like hostels in Bali, Phuket or highly touristic places around the world. We seek your kind understanding and we are constantly making little improvements! Feel free to share with us on how we could make ourselves better! We are conveniently located near the Xiamen University Student Dormitory bus station which happens to be the final destination for the public busses 20,52,135. More information under the directions section. 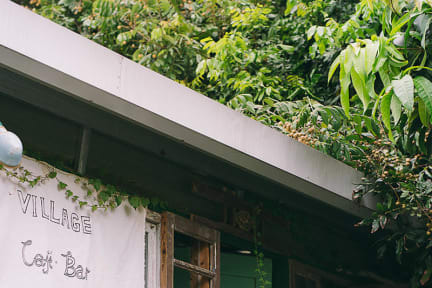 We recommend you search for this cafe called Dole Coffee, which happens to be a cafe right next to our little gate. We observe many students having coffee there after school and we think it will be an easier find when asking around. All that being said, feel free to call us once you have alighted from the public bus! During Chinese holidays, it happens to be a peak travelling period for the local Chinese and also an important period for our business to thrive for the year. Seasonality affects us and we want to be able to ensure our continued operations with income surpluses during this super peak month, hence we would seek your kind understanding that advance full payment will need to be collected prior to your arrival during this period. Our team will contact you after your booking through the platform and facilitate the process together. It's a bit hard to find but it is worth the trouble and to be honest I didn't mind getting lost in the alleys. Everyone there seemed super nice! A great place to stay for the right traveler! If you like the alternative, hipster/ hippie/ retro vibe, you will love this place as much as I did. The space is artistic and great, large communal areas, comfy couches etc. internet was really good, hot water, coffee and tea available for breakfast... just amazing. Best hostel I've been in during my long stay in china really. A plus is it is around the university, super close to the main attractions around the south. Good transport connections! This place is a little bit hard to find but they came to meet me when someone called them for me. The single room I stayed was clean but bed was low(no bed frame). ** spoke good English and helped me how to get to Yong Ding Toulou and made hotel reservation for me. A little hard to find the place, but just give them a call and the staff are super helpful. Was really warm with heater on at night. But bathrooms are basic, overall good. Based in an atmospheric if run-down series of courtyards. Everything is great apart from the location, which took me an hour to find with local help! There are some big pluses and minuses to this place. Pluses: nice location close to the sea/beach and right in the university area with eclectic, Taiwan-inspired restaurants next door. Minuses: run down building in hard to find nook. Staff are fine. We spent half of the day to find this hostel! And we've finally found it only becuase Chinese young people helped us. Why can't staff make a sign nerby? It was really cold in the room, room wasn't cozy, and bed linen was very old. But staff was nice and friendly. And they have coffee machine. My main two concerns: (1) I slept on a VERY thin (maybe two inches thick) mattress. I'm used to sleeping on hard mattresses, but this experience was really uncomfortable. (2) The staff were frequently unavailable. Coffee was said to be available from 9-10 a.m., but no one was in the cafe when I checked it. A towel was also said to be available on request, and again, when I went to make inquiries, the staff were unavailable. It is too difficult to find this hostel by ourselves because this hostel does not have a board. So you should call this hostel to pick us up. And dormitory room cannot use hot shower...too cold...in Jan.
First time giving a bad review but I couldn't help it. Do yourself a favor and shill out a few more bills and stay at a nicer place. My "bed" smelled moldy, the place was extremely noisy. Another girl complained that she couldn't get hot water in her room. The worst hostel I've been to, and I have travelled a lot.